The 49.6m (163’) sailing yacht Ohana is offering a special rate of €120,000 per week, down from €150,000 per week, in the Caribbean for the rest of the season. Ohana features a fixed bulb keel and a distinctive grey and yellow hull that makes her an impressive sight on the water. Built completely in aluminium, she is a perfect blend of lavish living spaces and high performance sailing, able to reach top speeds of 18 knots and a cruising speed of 12 knots. Complementing her modern and timeless exterior is a stunning interior that is light and airy, creating a contemporary and elegant atmosphere with natural tones throughout. Sailing yacht Ohana expertly combines excellent high performance with total comfort – giving her an unrivalled reputation for exceptional charters. Her fine interior was designed solely with the guest in mind – no detail has been omitted. She sleeps 10 guests across five sumptuous suites made up of a full-beam master suite, two doubles and two twins. Her crew of seven are highly capable and dedicated to provide the ultimate holiday, guided by the extremely knowledgeable Captain Mattia Dzaja. Carrying a range of water toys, Ohana is unmatched for sheer pleasure on the water. Water toys include a tender, a sailing dinghy, windsurfers, water skis and scuba diving gear plus a dive compressor and an array of towables. 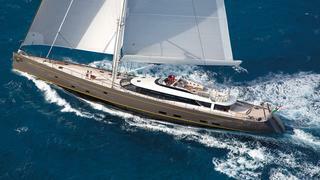 Ohana is available for charter through Fraser Yachts.